It’s not easy to get “alone time” when you’ve got a three-year-old. That’s why 10-minute showers turn into 20-minute escapes and a simple trip to the grocery store by myself takes 45 minutes while I walk up and down every aisle – and I only went there for bread and milk. It’s also why I wake up early every morning with my husband for our daily cup of coffee and Today Show break while our little one sleeps in. The best part of that daily meeting with my hubby isn’t Matt Lauer’s witty banter, it’s the coffee. That hot cup of caffeinated goodness creates a delicious moment of connection and it’s the perfect start to our day. We’re both big fans of flavored coffee creamers, especially this time of the year when all the seasonal flavors are available. (Our fridge door usually has between six and eight creamers at any given time.) During a recent trip to Walmart I spotted a whole bunch of fall flavors from Nestle Coffee-mate, including our all-time favorite, Pumpkin Spice. Of course, you don’t have to only put the creamers in your coffee. There’s a ton of recipes on the Coffee-mate website, including cold beverage and dessert ideas. After a peek at the dessert recipes, I can guarantee you I’ll be making the Cappuccino Cheesecake! When making pancakes, my husband even likes to mix a little Coffee-mate creamer into the batter (pick whatever flavor you’d like) to give the pancakes a little extra burst of flavor. This morning, however, there were no pancakes. Just two cups of Pumpkin Spice coffee, some chit chat, and Al Roker’s bad jokes. In other words, it was the perfect morning. How does your coffee help you create “moments of connection” with your friends and family? Mmm. I haven’t tried that kind of creamer before but it sounds delightful! I am drinking my coffee as I read this… Actually, let me correct that. I am drinking creamer with a little coffee. Creamer is my favorite treat, especially the flavored kind! I will be getting some pumpkin spice this fall, for sure! Sitting down to sip coffee (or tea) is a great lets me get some time away from the computer. In the mornings I chat with my husband and in the afternoons I will call a friend and chat on the phone. We love coffee break dates, too! We aren’t coffee drinkers here, but I do cherish the little moments I can spend with my husband. I love coffee and can have it everyday! Thanks for sharing this, and yes, I love the Nescafe expresso too. Oh I love flavored coffee, especially caramel flavor. I could drink that all day long. 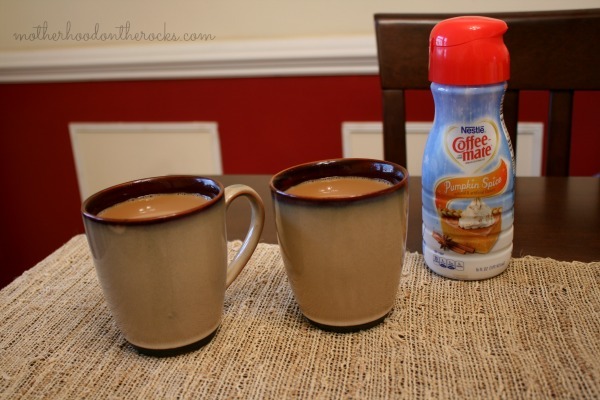 I cannot remember the last time I had creamer in my coffee….and I miss it!! It has to be CoffeeMate or nothing else! I love anything and everything Pumpkin Spice and this is the season for it!!! 🙂 I totally agree with you about the longer showers and grocery trips when the children aren’t around! LOL. For us, coffee is the first thing my husband and I run to when we wake up. He usually makes me a cup or I make him a cup–whoever gets there first! We love to chat while we sip our coffee! I definitely LOVE my coffee and everything pumpkin spice flavored this time of year! Isn’t it amazing how coffee brings you together. My husband and I share a similar moment in the morning, but for me it’s coffee and for him it’s English Breakfast Tea, either way it’s a great time to reconnect and get our day off on the good foot together. Great post, thanks for sharing! I love Coffee Mate creamers! It’s usually the brand I buy, and I love pumpkin spice. I’m looking forward to all the holiday creamers that start rolling out this time of year…yum! Oh my I am in LOVE with the Pumpkin Spice creamer!!! It is soooo amazingly good!! I drink energy drinks but my boyfriend drinks coffee. I will have to share this with him. I’m not a big coffee drinker, and neither is my hubby–despite our many, many years of university we just never got into it. We do both really love making iced tea though from speciality flavoured teas, so I can understand your connection over your beverage of choice. Isn’t it just a little piece of heaven to have those few quiet moments? I used to love coffee with Coffemate Hazelnut creamer. But alas, I gave up dairy, and caffeine! LOL. I can smell it from here!! I love pumpkin spice creamer! I’m not much of a coffee drinker, but my husband is.. I LOVE COFFEE!!! Can’t make it through my day without it! I love Coffee mate! What a great partner for coffee!! I’m not really a fan of coffee. DH drinks enough for both of us, though! He likes the Coffee Mate Nature’s Bliss vanilla creamer. I was SO excited to see my favorite pumpkin spice creamer back in the store! Mmmm Pumpkin Spice creamer sounds so good. I love coffee too and will have to keep my eyes open for this flavor! it’s the perfect fall flavor for coffee. my husband laughs at my obsession but i change flavors with seasons, mood, etc. i have 3 flavors here right now! I love a good cup of coffee, and Coffee Mate makes a good cup a great cup! I love Coffee Mate when I want to spruce up a boring cup of coffee! Now I’m in the mood for some. I love the pumpkin creamer. We use a lot of it in my house this time of year. Oh the pumpkin creamer is one of my favorites. I tend to do lattes over regular coffee but, if I am in a pinch and have to have coffee, I prefer Coffee Mate creamer. I love flavored creamers and especially the ones for the holidays – yum!!!! Oooo i’m dying to try pumpkin spice!! I’ll have to pick that up this week at the store. I think those early moments of morning togetherness with coffee before the madness of the day begins are wonderful! That sound relaxing. a quiet time with better half over a cup of delicious coffee. Pumpkin creamer sounds really yummy. 🙂 It’s nice to hear how you wake up early to drink coffee with your hubby – that’s some strong love! Personally, nothing would get me out of bed. I don’t drink coffee but use the creamers for recipes / baking. I have lots of friends who have a little coffee with their creamer. I love flavored coffee creamers too. The Peppermint Mocha sounds like a good one to me! Huge Coffemate fans here too! My hubby and I both like our coffee black. But we like flavored coffees. I too get up early to enjoy my coffee while the kids are still sleeping. Of course I always have to have some delicious creamer, but I think I’ll be trying that cheesecake recipe you linked to.